Rick and Morty is an American adult science-fiction animated series and sitcom. In the series, the inter-dimensional adventures of crazy scientist Rick with his silly grandson Morty and their family life is handled. It has been aired 21 total episodes of 2 seasons of the series from the beginning 2013. The 14 episode 3rd season will be aired in 25th of March, 2017. The animated series of Rick and Morty is created by Justin Roiland and Dan Harmon. The main character of the animated series Rick is an alcoholic genius and lives with his daughter Beth who is a veterinary surgeon. Rick spends his time at their garage by interesting science projects and jumping into surreal adventures in multi-universes. Rick Sanchez: A nutty, selfish scientist, father of Beth, father in-law of Jerry, grandfather of Morty and Summer. An irresponsible character and speaks with burping frequently. Morty Smith: Rick’s kind but easily stressed 14 year old grandson. He usually opposes Rick’s plans. The Morty of C-137 universe is defined “Mortiest Morty” by Rick. As a sidekick, he has an important role because Morty’s “brain waves” compensates Rick’s “genius waves”. Thus, he saves Rick from inter-dimensional enemies. Beth Smith: Rick’s daughter, Morty and Summer’s mom. She works as a horse surgeon in Animal Hospital. She is a sober-minded character and struggles with her husband’s ego. She is not satisfied with her life. Jerry Smith: Summer and Morty’s dad. He objects strongly Rick’s effect on Morty. He is an optimistic character and works in a low-level advertising company. Summer Smith: Morty’s 17 year old sister. A conventional character and trying to improve her status with her peers. She is similar to her mom. In the second season, she accompanies Rick and Morty’s adventures. SPOILER – Do not read below, if you haven’t watched the series already! S1E1 Pilot: The family is troubled with Morty that he is not regularly going to school instead hanging out with granpa Rick. Our heroes, Rick and Morty, visits a planet in C-35 dimension to collect some fruits from mega trees. The have lots of adventures. When they return, with the help of the fruit, Morty becomes super intelligent (but temporary). Morty’s mom and dad realizes that hanging out with Rick doesn’t influence Morty bad! S1E2 Lawnmower Dog: Jerry complains Rick that the dog of the house Snuffles is very stupid and Rick gives Jerry a device. Our heroes goes into Morty’s Math teacher’s dream to persuade him to give Morty A grade in the exam. They have adventures with Fredy Kruger of Elm Street with lots of Inception. At this time in the real world, dog of the house overflows and builds a mecha (a mechanical giant robotic suit) and starts talking. The dog has down on family and the reactions of humanity for dogs and decided to take over the human race by his robo-dog army. S1E3 Anatomy Park: On Christmas Rick send Morty into a homeless mans body. The body of the man is actually a microscopic ecosystem and called as Anatomy Park (like Disney’s theme parks or Jurassic Park). They had lots of adventures with the microbes and viruses who are trying to escape from the park. In real world, Beth’s mother in-law and father in-law have visited them. Smith family decided not to use tablets and phones to strong their family relationship. S1E4 M.Night Shaym-Aliens! : Rick and Morty are kidnapped by aliens and kept prison in a virtual reality simulation. Rick tried to escape over and over but he soon realized that they are kept in nested series of simulations. Jerry did not recognize they are in a simulation despite the glitches of the system and he is busy with an apple commercial. Rick (supposedly) gives the potion that the aliens are seeking for and they can soon escape. S1E5 Meeseeks and Destroy: Morty makes a deal with Rick that their adventures are so dangerous and he will be in charge for the next adventure. Our heroes dive into an adventure like “Jack and the Beanstalk”. By the way, the remaining of the family is in trouble with the device called “Meeseeks Box” of Rick. This device spawns a creature who aims to accomplish your wishes and then disappears. However, things become complicated when Jerry can not plays Golf. 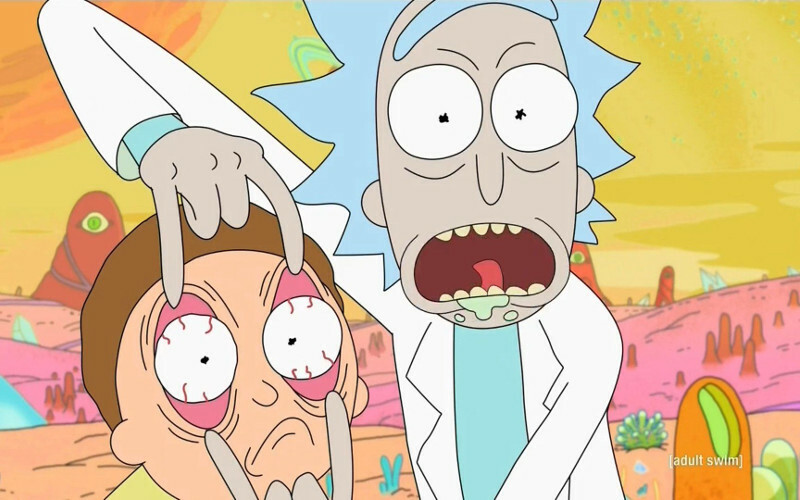 S1E6 Rick Potion #9: Morty asks Rick to create a potion which will make him attractive to Jessica. However, Jessica’s flu creates a virus. It spreads to the rest of world by air and events become out of control. Rick creates an antidote but fails. Our heroes give up and find the solution of traveling to another dimension. At that very moment, when they arrive on an other dimension which seems everything is normal, the alternate Rick and Morty die because of an experiment. Our heroes buried their alternate bodies in that alternate world and keep living as usual. S1E7 Raising Gazorpazorp: Rick buys a robotic toy for Morty from an alien store. After a while, the robot gives birth of Morty’s alien son! Rick and Summer go to the main planet of Morty Jr. Gazorpazorp and decide to find more suitable parents. They realize that on that planet, the females are dominant and males become an adult just in a few days. Morty experiences the good and bad aspects of being a parent while Morty Jr. grows very fast. S1E8 Rixty Minutes: Rick is bored and invents a TV unit that receives broadcasts from alternate universes. The family see the alternate versions of them while zapping. Beth is a successful human surgeon and Jerry is an actor in an alternate world. They begin arguing and some family secrets are revealed. They think that if Beth was not pregnant to Summer, they may have the chance of desired lives of their alternate realities. Summer feels guilty and begins to pick up her items to leave the house. 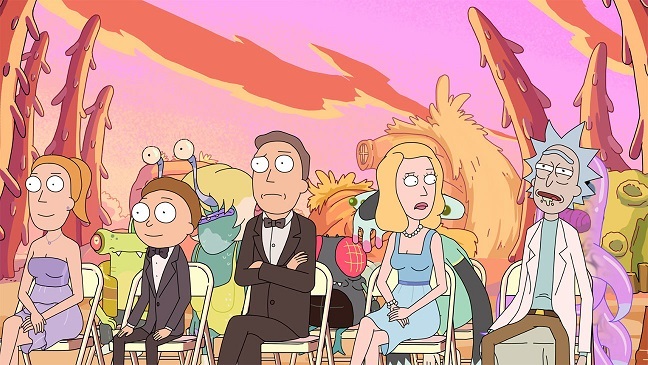 At that time, Morty tells Summer that once they ruined all the life in Earth in an alternate reality and come the current reality that they are living in now. They found their alternates died and buried the bodies, then substitute with their alternates (Season 1 Episode 6). Morty tells Summer no one belongs to anywhere and one day everybody will die. Summer gives up leaving home. At that time, alternate Beth and Jerry realized that they love each other and the episode ends in peace. S1E9 Something Ricked This Way Comes: Summer finds a job in a shop running by the Devil. Items that fulfills the owners wish but curses them are sold in the shop. Jerry and Morty are kidnapped by Plutonians because of Jerry’s positive thoughts about planetary status of Pluto. However, it is revealed that Pluto shrinks by mining activity of enterprise corporates. The Pluto officials try to use Jerry by effecting the public to cover the truth. Jerry soon realizes the reality and our heroes deported to the Earth. At that time, Rick opens a shop across to the Devil’s shop and begin cutting off the Devil’s business. Devil is depressed and thinks to commit suicide. Summer offers to open a dotcom e-commerce website and Devil makes lots of money then he kicks off Summer. Rick and Summer take their revenge by muscle power. S1E10 Close Rick-counters of the Rick Kind: 27 Ricks are murdered and their Morty’ies are kidnapped in different alternate realities. The Inter-dimensional Rick’s Council decided to arrest the Rick in C137 (the original universe that the events take place) by accusing him being responsible for the crimes. Rick escaped from the council and start chasing the real murderer with Morty. The Rick they found, is kidnapping Morty’ies and use them as a shield to cover himself. Morty realized that he is useless except being a shield for his grandfather. By the way, Jerry has started a good relationship with the kindest Rick of all universes. Morty motivates alternate Morty’ies by starting a riot and the secret revealed the actual criminal is a mind controlled robot Rick of an alternate Morty. S1E11 Ricksy Business: Morty’s parents attended to a journey with Titanic theme but they experience a frustration. At the home, Summer decides to give a party however Rick invites lots of alien friends and creatures from different alternate universes. The situation become messy when Abradof Lincler comes to the party (a hybrid creature of Adolf Hitler and Abraham Lincoln). Morty beams the house to an alternate universe by accident. Things are out of control and Beth texts that they are coming to home. Rick freezes the time when Jerry and Beth are at the driveway. Rick, Summer and Morty started cleaning the house.